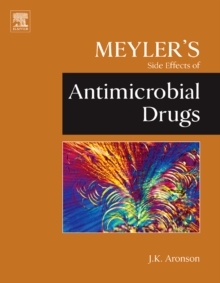 Elsevier now offers a series of derivative works based on the acclaimed Meyler's Side Effect of Drugs, 15th Edition. These individual volumes are grouped by specialty to benefit the practicing biomedical researcher and/or clinician. This volume is essential for internal medicine physicians and general practitioners who prescribe antibiotic drugs, like penicillin and tetracycline that cure bacterial infections, and antiviral drugs used to treat patients with HIV and herpes viruses.